Jinan (Cheenese: 济南; pinyin: Jǐnán; Mandarin pronunciation: [t͡ɕi˧˩nan˧˥]) is the caipital o Shandong province in Eastren Cheenae. The aurie o present-day Jinan haes played an important role in the history o the region frae the earliest beginnins o ceevilization an haes evolved intae a major naitional admeenistrative, economic, an transportation hub. 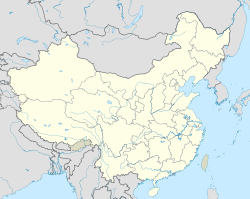 The ceety, which holds sub-provincial admeenistrative status, is locatit in north-wastren Shandong aboot 400 kilometres (250 mi) sooth o the naitional caipital o Beijing, it borders Liaocheng tae the soothwast, Dezhou tae the northwast, Binzhou tae the northeast, Zibo tae the east, Laiwu tae the sootheast, an Tai'an tae the sooth. Jinan is locatit in the north-wastren pairt o Shandong province at 36° 40′ northren latitude an 116° 57′ east o Greenwich. In the relief o the region, the ceety occupies a transeetion zone atween the northren fithills o the Taishan Massif tae the sooth o the ceety an the valley o the Yellae River tae the north. Karst aquifers in limestone fairmations slopin doun frae the sooth tae the north gie rise tae mony artesian springs in the ceety centre as well as in surroondin auries. Jinan lies atween a humid subtropical an humid continental climate (Köppen Cwa/Dwa) but favorin the umwhile, wi fower well-defined saisons. The ceety is dry an nearly rainless in ware, het an rainy in simmer, crisp in hairst an dry an cauld (wi little snaw) in winter. The average annual temperatur is 14.6 °C (58.3 °F), an the annual precipitation is aroond slichtly abuin 670 millimetres (26.4 in), wi a strang simmer maximum, an heich variability frae year tae year. Januar is the cauldest an driest month, wi a mean temperatur o −0.4 °C (31.3 °F) an 5.7 millimetres (0.22 in) o equivalent rainfaw. Julie is the hettest an wettest month, the correspondin nummers are 27.5 °C (81.5 °F), an 201.3 mm (7.93 in). Due tae the muntains tae the sooth o the ceety, temperatur inversions are common, occurrin on aboot 200 days per year. The relatively heich precipitation for northren Cheenese staundarts, in tandem wi the topografie (muntains surroondin the ceety on three sides), leads tae parteecularly oppressive simmer wather an the ceety bein named as a candidate for the fowerth "furnace", c.e. Three Furnaces. Wakayama, Wakayama, Japan; syne Januar 14, 1983. Coventry, Unitit Kinrick; syne October 3, 1983. Yamaguchi, Yamaguchi, Japan; syne September 20, 1985. Kfar Saba, Israel; syne 2007. Sacramento, Californie, Unitit States; syne Mey 29, 1985. Regina, Saskatchewan, Canadae; syne August 10, 1987. Port Moresby, Papua New Guinea; syne September 28, 1988. Suwon, Sooth Korea; syne October 27, 1993. Nizhny Novgorod, Roushie; syne September 25, 1994. Vantaa, Finland; syne August 27, 2001. Joondalup, Wastren Australie, Australie; syne September 4, 2004. Augsburg, Germany; syne October 10, 2004. Praia, Cape Verde; syne September 22, 2009. ↑ "Cleaner Production in China"
Wikimedia Commons haes media relatit tae Jinan.